It was the morning of 12 July 2008 when a call from the Netherlands embassy changed my life forever. Mr. Harry, then the fellowship officer, delivered the good news that I had been awarded a scholarship to study at ITC. I was very excited because my dream had been fulfilled. According to my ITC admission letter, I could expect to obtain an MSc degree after 18 months … but not also find my future husband. I think it’s the best non-scientific bonus that ITC offers. But again, I have been asking myself this question: What are the chances of finding true love at the “International Torture Centre”? I’m very sure most of you know or still remember the torture but how about the great reward I am talking about? I think this could be a potential Ph.D. topic … although I guess this topic won’t be needed since we already have the results! 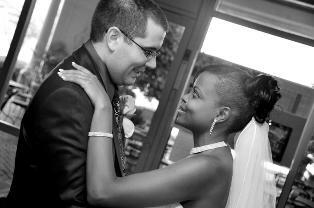 It all started in November 2008, when an e-mail that Brandon addressed to me opened the door to our relationship. ITC gave us the best dating environment because we had good times and tough moments. We went on all those cold ITC field trips together; we trudged in the snow on so many mornings together, especially on Saturdays going to the market. These moments brought us even closer together and made our relationship stronger. We always told ourselves that, if we could survive the torture center, then nothing could ever defeat us. ITC gave us the best platform for endurance and patience, which are the basic principles of relationships. On the morning of 23 July 2009, Brandon asked me to come with him for a walk in G.J. van Heek Park, Enschede, and that’s where he asked me to marry him. The engagement ring was very special to Brandon and I now feel honored to wear it. The ring belonged to his grandmother, who passed away while we were studying at ITC. Unfortunately, I never met her, but every time I look at it, it reminds me of how blessed I am to be part of his lovely family. On 29 December, while on our trip to Paris, we bought our wedding bands. 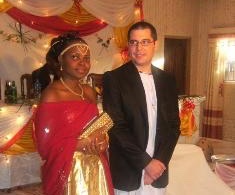 After graduation, Brandon came with me to Uganda to meet my family. He was very excited because it was his first time in Africa. 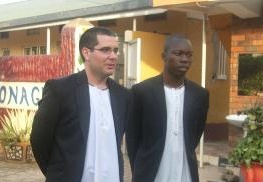 The introduction ceremony, called a kwanjula, was fantastic and for the first time Brandon put on our traditional attire, a kanzu, as an in-law. He loved every minute of the ceremony − although he was a bit overwhelmed by the size of my family since he himself comes from a very small family. After earning a certificate in Geographical Information Systems, I wanted to further my education by obtaining a Master’s degree. After searching for schools in my home state without success, I began expanding my search and that led me to ITC. When I read about ITC online, I instantly knew it was the school for me. Little did I know, I would be walking away from ITC with a Master’s degree and my future wife! Susan later joined me in the United States in May 2010. 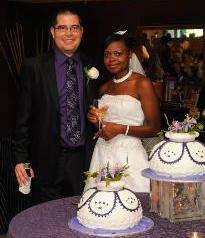 On 24 July 2010, we got married in Richmond, Virginia, at my childhood church, Manakin Episcopal. The wedding was fantastic − although few of Susan’s friends and family could attend because of the distance. We are now living happily together in Gaithersburg, Maryland, which is just outside Washington DC. I am working as a geospatial analyst task manager at MDA Information Systems in Rockville, Maryland. ITC not only offered us the opportunity to meet but also allowed us to learn how to associate and live with people from across the world. Thank you ITC for the knowledge and skills you gave us and for bringing us together! Long live the ITC family!